Earn $10.80 in VIP credit (1080 points)What's This? Top quality tubular tire for racing. 350 threads per inch core spun cotton casing construction. Latex tube, removable valve cores. Calicot puncture resistant layer under the tread. 145 max. psi. 700c x 22mm (22-622 ISO). 203 grams. Black tread/gumwall side. Handmade in Italy. 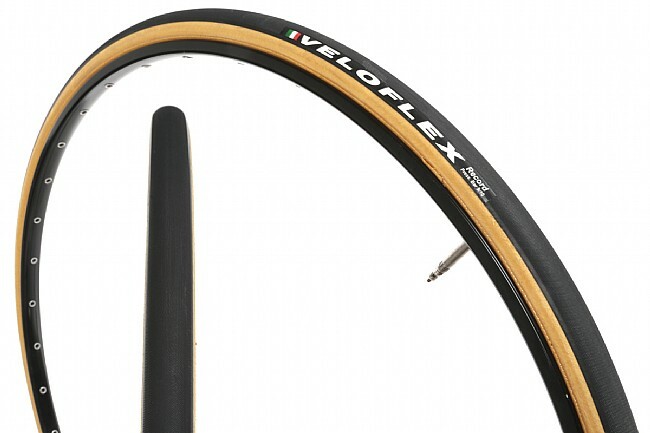 Veloflex are some of the most supple tires on the market. The best for racing even though they might not handle very rough pavement as well as Contis. These are the ultimate racing tires. Light and very fast but highly prone to flats - for example if you skid the tire it's basically done. So ride with extreme care, races only, and don't let it touch a trainer and it should be good for limited time trials and hill climbs but for more general use stick to the Veloflex Carbon. Great price on a fast racing tire. Racing tire only. Rolls very fast. Susceptible to sidewall pinch flats at 100 psi with a 145 lb rider. No problem at 120 psi. Used for racing only. This is a lightweight, easy rolling tire that is VERY fast. The good news is the sidewalls are thin making the tire very supple and allowing a low rolling resistance. The bad news is the sidewalls are thin making the tire susceptible to sidewall pinch flats at 100 psi with a 145 lb rider. No problem at 120 psi. I rode this tire to 2nd place in the Kona IRONMAN in the 60-64 mens age group. This is a VERY good racing tire - just make sure you ride it with enough pressure. expensive but the best tire for anything where speed is required. It can take and needs high pressure because its ends up at about 20c width.